An American university student flying home for a surgical operation and carrying a dwarf hamster for emotional support finished up flushing the animal down an airport toilet. According to the student, Belen Aldecosea, 21, airline staff told her the hamster couldn’t fly with her in the aircraft cabin. The sad story was related in the Miami Herald. Aldecosea claims a Spirit Airlines employee told her when she made her booking that Pebbles (the dwarf hamster) could fly in the cabin with her. But when Aldecosea reached Baltimore’s airport, she claims she was told the opposite, with another Spirit employee allegedly giving her the option of either freeing the hamster outside or flushing it down an airport toilet. After hours trying to work the situation out, and not wanting to put her pet into the bitter cold outside, Aldecosea is said to have flushed the hapless animal down the toilet. Dwarf hamsters are about the size of mice. Adults grow only to about 9 or 10 centimetres long. 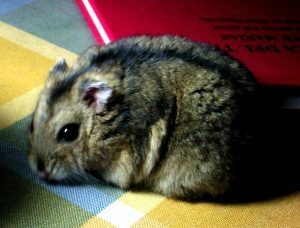 Spirit admits an employee incorrectly told Aldecosea that a hamster could travel with her – but it strongly denies that another of its workers suggested Aldecosea kill the hamster. Aldecosea says she may sue Spirit over the decision about her hamster, which she claims the airline forced on her. Spirit’s pet policy says dogs, cats and household birds are allowed on its aircraft but it draws the line at rodents, which it states “will not be accepted”. Hamsters are rodents.